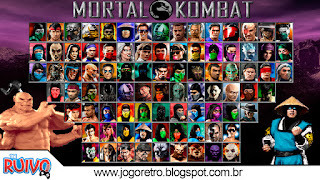 Gameplay e download no blog de Mortal Kombat Project (MKP Season 2.9), feito com base na engine M.U.G.E.N. O jogo traz personagens de várias edições da série MK, incluindo adaptações em 2D de novos personagens exclusivos de MK9 e MKX. MK Project Season 2.9 → by MKP Team e Borg117. Ultimate Update → by Gui0007. Stages Authors & Editors → Lean MK/Le@N, Borg117, Spor/Faust, Fly, mkfreak89, Bathory, JohnnyCage999, Adriano GT, Nintality/Mortalist, DarkEvilous, Leandro/LeandroTM, Markos, Max Arturo, RatonMalo, stopmotiontoys, Lows 9.0, Sannamy, Hanzo Hasashi, Nero from lodran/roney, Reptile, Tetravega, shammahalfa1, RatonMalo, BlackJack, Halilscorpion, RU Design, Dresmasher, O Ilusionista, Osiris/Gary Watcher, ShadowGlobe, TheXD3ath, Teros, LaposMK, Behzad, Rugal2, Gary Fisher, Ziltama, Orn'Cayosin, Jason/DarkHorse, Tomaz, BlackCyraxCO, Wodash, Haso 3D, Black Shadow/Ruslan, Xclusive, Felix, Chameleon, Master Yoda & Camus.